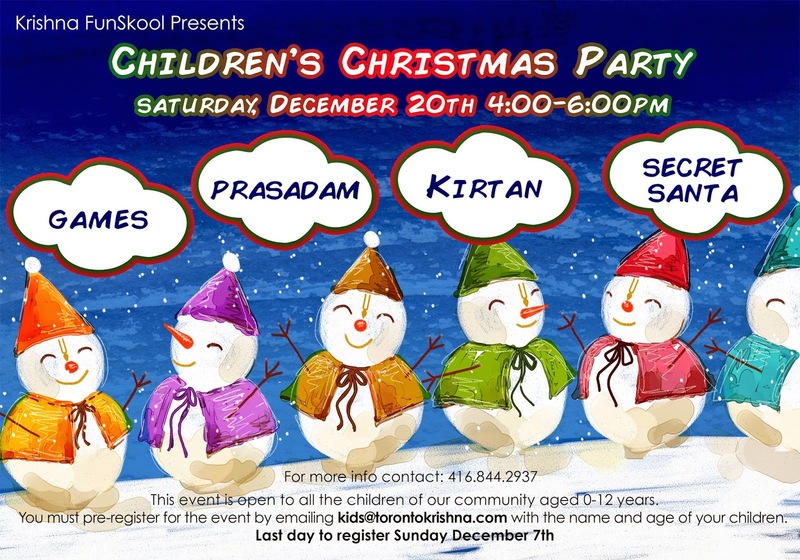 Children's Christmas Party - Dec 20th ~ The Toronto Hare Krishna Temple! To celebrate the end of another exciting year, the Krishna FunSkool Team is organizing a very special Christmas Party. This event is open for all children (up to the age of 12 years) of our community. You do not have to be a registered student of Krishna FunSkool to attend. It promises to be a fun-filled evening with kirtan, games, prasadam and presents! We request you to register your children by emailing us at kids@torontokrishna.com before Dec 15th.